8 distance miles on the DDMR today at about 11:00am, 38 degrees, lt. breeze, mostly sunshine. 104 days till Boston (#122) 2018. I'm going to have to sit down and make my running plans and schedule for 2018 really soon. 15.5 mile long run, 38*, fog everywhere, no wind, 100% humidity. Boston in 99 days!!! 1 mi cardio warm up run and a full body workout @ the gym. 7 distance miles today. 39*, lt breeze, intermitten rain. I managed to get out between rain storms and not get rained on. 9 Tempo miles today on the DDMR. 43*, 73% humidity, 11 mph winds, all this in crisp and clean air after all the rain and winds last night, then a Full Body Workout at the gym. 4 easy miles, 40*, 63% humidity, s 4 mph breeze. that gives me 50 mi for the week. & a full body workout at the gym. 3 easy recovery miles and a full body workout this am. 9.5 Interval miles On the Mt. Road. 42* st / 49* end, SE 6 mph, 37% humidity. 90 days till Boston! 6 Distance miles on the small block. Full Body Workout at the gym. 10 mile MLR run today on the PRT. 45* st / 58* end, Wind NW 6 mph, humidity 42%. Nice run today, I feel as though my overall training plan is coming to fruition. 4 easy miles on the small block. 54*, SW 14 mph winds, 48% humidity with snow predicted tonight. 3 mi on the small block today. There was so much snow and it was so dangerous trying to run in traffic I cut the run short and opted to rest up for a 17 mile long run tomorrow. 17 long distance miles on the Mt road & Big Block course. 29* but felt like 18* with 12 mph winds, 66 % humidity. This run sucked because of all the snow, ice and having to dodge all the cars and trucks on the roads.......but I got it done! 3 recovery miles today. Full Body Workout at gym, 20 minutes in Steam room, 310 situps. 11.5 Int. miles today on the Mt road, 40*, 57% humidity, s 4 mph winds, sunny. Full Body Workout at gym. 18 long distance miles today. 40*st/54*end, partly cloudy, 0 wind. 3 recovery miles and a FB W/O. 50*, no wind, mostly sunny skies. 300 sets, 200 lifts, 30 minutes in the saunas. 8.5 mile interval training. 54*, SSE 10 mph winds, 44% humidity. 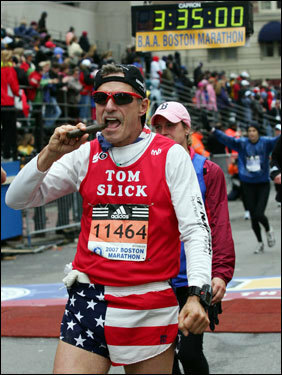 76 days till Boston!